After missing Janus due to a mixup at Will Call (friggin’ bastards), I made my way into the Rapids Theatre nestled in the heart of “beautiful” Niagara Falls, in order to catch most of Middle Class Rut’s set. They served as a somewhat-quality appetizer for the fulfilling and delicious entrée that was to be Chevelle, and I say somewhat-quality because, yes, while this duo has talent and if you have yet to experience the band’s latest album No Name No Color, you should (peep our review here), their noise-infused rock didn’t really gel entirely with the venue’s interesting acoustic dynamic. Regardless, their set was enjoy thoroughly and was well-received by those in attendance, including those with me who had never heard the band before. The almighty Chevelle was next, and they far surpassed any and all of my expectations. Mind you, I’ve only seen the band perform live once, and that was opening for Three Days Grace at the Erie Civic Center in Erie, PA, and they weren’t good. But, but, they blew my mind this time around armed with powerful new material off of their excellent release Hats Off to the Bull (review here), including eventual encore closer “Face to the Floor,” “Hats Off to the Bull” and “Same Old Trip,” though the band didn’t neglect older entries into their cannon, including firing off tracks from Wonder Whats Next (“Send the Pain Below,” “Closure”), This Type of Thinking (Could Do Us In) (“Vitamin R (Leading Us Along),” “The Clincher”), Vena Sera (“Well Enough Alone,” “Antisaint”) and Sci-Fi Crimes (“Sleep Apnea,” “Jars”). The highlight of the set was “The Red,” which opened the bands encore and saw frontman Pete Loeffler alone on stage with a guitar in hand, allowing the crowd to sing the song word for word (not unlike Our Lady Peace’s “Life” as Raine Maida turning the microphone around to the crowd) in an over-the-top powerful moment that was really one of those ‘had to be there’ type of experiences. 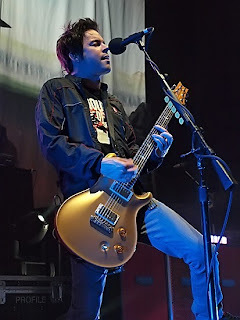 Chevelle was masterful, near brilliant, during their time on stage, at times giving me chills and goosebumps time and time again. Get online, check the tour dates, but you need to be part of this tour, seriously.